Here is some information on the various sightseeing Melbourne tours: some slow and intimate, others exhilarating. There are the usual tourist options as well. We can recommend each of the following operators. If you do not know Melbourne, there is chance that you could miss the best Melbourne sights. The secret and charm of Melbourne lies in its intimate laneways and hidden spots, cafes, bars and laneways, many only known to locals. 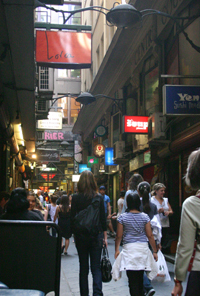 There you can find uniquely Melbourne spaces and shops. Hiding in basements are many of the emerging Australian creative talents and thriving small business. There you find one-off pieces, fashion, food, art, music, chocolate, accessories, vintage and more! There are a number of great Melbourne walking tours, that will help you find these real Melbourne spots, treasures and unique shops. Each of these will give you your bearings and an insiders knowledge of Melbourne places you would probably want to come back to. They are wonderful eye-openers for locals and visitors alike! If you have any special tips, here is where you can share your recommendations about any hidden Melbourne sights that is - if you don't want to keep to yourself. The bike is an integral part of life in Melbourne. From the seat of a bike, you really get the experience and feel of Melbourne, and do some real sightseeing! However, organised bike tours have discontinued running, but there are shops where you can hire a bike. A convenient one is at Fed Square from which you can hop on the bike and trail up the Yarra - for an hour or a whole day along Melbourne's most beautiful and serene bike tracks. Or you can get a Melbourne Bike Share bike and explore the City Sights, or the eclectic and cool Fitzroy. I reckon the bike is the best mode of transport in Melbourne - unless it's too hot or pooring rain. And you can do it without riding on major roads. Melbourne is criss-crossed with bike paths and small quiet streets. Melbourne Kayak Tours give you a unique way of sightseeing Melbourne, while kayaking along the Yarra, from the Docklands past many landmarks, including Southbank, Federation Square and Flinders Street Station, while your guide is giving you a rundown of the Melbourne history and culture. You have two options: an afternoon Docklands Kayak Tour or a longer Melbourne by Night Kayak Tour. Each enjoys the panoramic views of the city skyline, its iconic buildings and Bolte Bridge. A fish-and-chip dinner is served aboard your kayak. No previous experience is necessary. During the Melbourne Underbelly Crime Tour you will discover the darker side of Melbourne. While walking in the footsteps of notorious criminals, you get to explore Melbourne's seedy underbelly, its murders, mobsters, mayhem and scenes of the most infamous criminal events taken place in this city. You learn about the wrongful conviction of the Gun Alley Murderer, try solve the mystery of the most daring Australian armed robbery, and hear the sad story of the infamous Society Murders by their own son. Do you know why a promising tennis player walks into a Melbourne post office and start shooting? It finishes up with you getting arrested and locked up at Melbourne City Watch House. Not for the faint-hearted! The Sports Lovers Tour of Melbourne is extremely popular. You can either do a full or half day tour visiting Melbourne's famous sporting venues and exploring the history and excitement of Australian sports. The sports tour includes the Flemington Racecourse, the 2006 Commonwealth Games Village, a drive around Melbourne's F1 Grand Prix racetrack, Melbourne Sports and Aquatic Centre, a behind-the-scenes visit to the Melbourne Cricket Ground (MCG) and/or Rod Laver Arena, and lunch at Etihad Stadium, a sport lovers way of sightseeing Melbourne. You then have various options to extend the tour to include the Eureka Skydeck, an Etihad Stadium tour, a Tennis tour, an MCG and National Sports Museum tour, or the Rod Laver Arena and the National Sports Museum. ALL GOOD! Watching sport and beer go hand-in-hand, so here it is, the Sports Lovers Tours plus Forsters Australia Brewery. You get to see the best sporting venues in Melbourne, combined with a tour of The Carlton and United Brewery, the creators of Fosters, Victoria Bitter and Carlton Draught! The morning Sports Tour is the same as the Sports Lover Tour above, but you then spend the afternoon experiencing the past, present and future of beer and brewing in Australia in its largest brewery. It includes free beer tasting! If you like splendor and speed, you can get a bird's eye view of Melbourne on this great-value Melbourne Helicopter tour. You take off from Essendon Airport, and during a 18-20 minute helicopter flight fly over the Docklands, Eureka Tower, Rod Laver Arena, Melbourne Cricket Ground and the Exhibition Buildings. Go sightseeing Melbourne from the air on an exhilarating 20-minute scenic Melbourne Helicopter Tour over central Melbourne, over the city's great sporting venues, Flemington Racecourse and F1 Grand Prix track and, at 500 feet, along St Kilda Beach. This tour includes refreshments at a V.I.P. departure lounge before your helicopter flight, and is a luxurious experience not to be missed! If you are in Melbourne for only a day or two and really want to see it all, you may consider some of the following Melbourne sightseeing tours. They are good value and will give you an overview of the sights of Melbourne. Also check the Melbourne River Cruises! The Best of Melbourne City Tour with Tramcar Restaurant gives you a scenic cruise on the Yarra, a bus tour of Melbourne's highlights, and a visit to the beautiful Dandenong National Park. It is a quick overview for a first time visitor. Having dinner at the Colonial Tramcar Restaurant while touring the streets of Melbourne is an unforgettable treat that makes this a special tour indeed. The Melbourne City Afternoon Tour is another overview of the main Melbourne attractions and sites, with a focus on cultural icons, historic buildings as well as leisure things to do in this city! It also includes a tour to the towering forests and native wildlife of the Dandenong Ranges. If you want to do a lot of sightseeing Melbourne in a few days, or if you want to explore many Melbourne attractions over a 3 month period, you can get excellent value for money with the Melbourne Sightseeing and Attraction Pass. It covers all major and many other interesting attractions, and will save you a lot on entry fees. If you like to do a number of Melbourne Tours, or tour other Australian cities, the Australia Sightseeing Pass will also save you money. In Melbourne you can see the Penguin Parade, the Great Ocean Road, Sovereign Hill, the Puffing Billy, Yarra Valley and more, at much discounted rates.